I hadn’t yet made it through my 1st week of a four-week work trip in Armenia, and I was already tired of the cold, the wet, and mostly, of seeing the shivering, hungry, too-skinny dogs wandering the streets of Yerevan. Even for Armenia, December of 2008 was a cold and icy month. How was I going to make it through 3 ½ more weeks, when after only a few days I could barely face the world outside my guest house? My walk from guest house to office involved crossing several busy streets, where people and dogs swerved among the vehicles, whose drivers had no time or patience to make a full stop. Dogs quickly learn to wait with the people at stop lights and cross when the people cross. If they don’t learn that lesson quickly, they don’t survive; a dogs’ life in Yerevan is cheap, and for harried drivers, swerving to avoid a dog is too much effort. 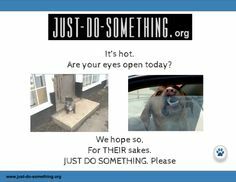 That winter of 2008, everywhere I went in Yerevan, I saw dogs searching for a dry sunny spot (almost impossible to find). I saw cats perched on roofs; the luckier ones found broken basement windows, where they could sneak inside and warm up. Along my route, I knew every grocery-deli that sold small sausage links that I could easily throw to or leave for the dogs I met as I walked to and from work. The deli workers must have thought I had a voracious appetite for Armenian sausages. Water was scarce-it didn’t get warm enough for the ice to melt, so I filled containers with water for dogs to drink with their sausages. Admittedly, I’m dog crazy and I love them all. But sometimes one dog will steal my heart. Back in 2008 in Yerevan, a small, young, sweet black dog melted me. She seemed so vulnerable, not a street-smart city girl, she needed someone to help her learn the ropes. I gave her sausage links and she followed me back to my guest house. I asked if she could stay in the yard. I was hopeful; the guest house owner had lived in California for years, I was sure he understood that many Americans are dog crazy. I hoped he had lived in America long enough to get smitten with dogs. He made an attempt to act concerned but his “no” showed no real emotion. 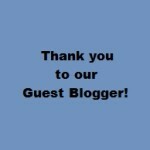 I wasn’t in a position to switch guest houses, and it was highly unlikely I’d find one that allowed dogs as guests. The morning after she followed me home, even before I brushed my teeth, I threw my jacket on and found my dog waiting for me, curled up outside the door to the guest house. We greeted each other like we belonged to each other. I quickly realized that this situation was not sustainable-I was going to leave Armenia in a few weeks, she was not (I already had four dogs and two cats at home, my work required a lot of overseas travel and time away from home.) Soon she’ll be waiting for me in the mornings and after work, and I won’t show up. So I asked the Armenians I worked with if they knew of an animal shelter and was told about Nune Mehrabyan, a pianist, who started the only shelter in Yerevan. Because cat and dog population control in Yerevan is mainly through government contracted shooters who roam the streets in search of dogs or takes place behind the scenes at a contractor operated facility (many horror stories are told about that facility), Nune was often interviewed in newspapers and on TV to provide an argument for more humane population control. Because of her media presence, Nune and her shelter were well-known around Yerevan. That weekend, I met Nune at the Save the Animals-Armenia shelter in Eribuni, an industrial area of Yerevan, where about 220 dogs were housed. That was the start of our friendship; a mutual love for dogs and an overwhelming feeling of wanting to help the helpless overcame our language barrier. I learned that Nune couldn’t stand hearing the shooting every night and thinking about the dogs being killed or injured just because they had no homes. She pleaded for help from friends and family and raised enough money to buy land and open the first animal shelter in Yerevan. Over time, her promising career as a pianist took a back seat to the more immediate need of saving Yerevan’s dogs. The Save the Animals’ shelter was pretty basic. There was lots of space and some fenced yards so the dogs could get out of their pens to exercise and socialize. 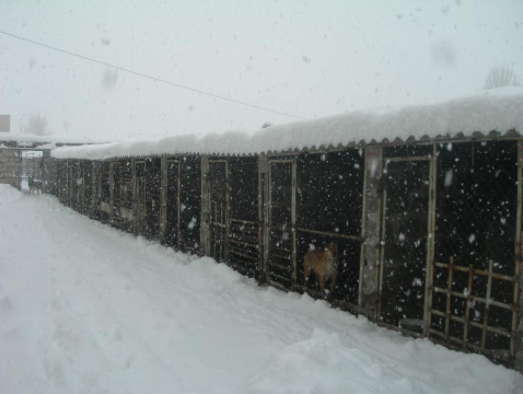 But the pens had no roofs, and during that icy cold winter, it was hard for the dogs to stay warm and dry. 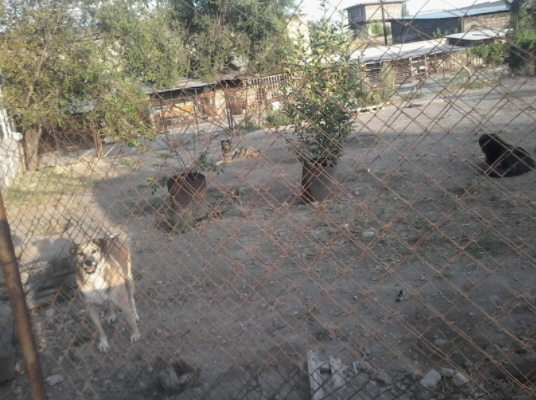 Still, it was so much better than life on the street; here the dogs were safe, got nutritious food, exercise, and love. I spent my remaining weekends at the shelter, petting and brushing the dogs, spending time with the emotionally scarred ones. 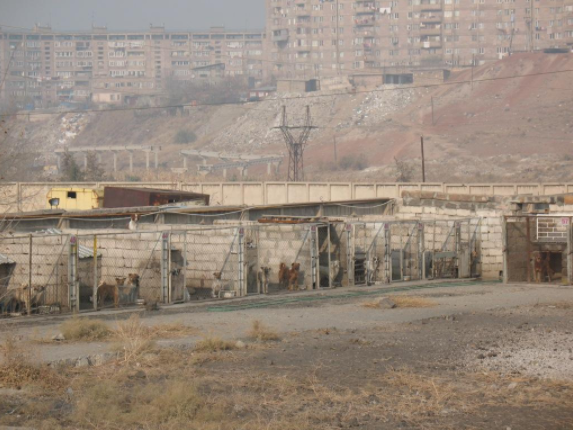 The Save the Animals-Armenia shelter in 2008 (before improvements). Nune helped me arrange a spay appointment for my Armenian dog and found a taxi driver that didn’t mind carrying a dog in his car. I brought her for her spay appointment, relieved that for a few days, she’d be safe at the vet’s office. One day, Nune called me to tell me she was picking me up at 5 AM the following day, would bring me back to the guest house by 7 AM. Sometimes the language barrier can’t be crossed, and I had no idea what was happening between 5 and 7 AM. Groggy and cold at 5 AM, I dragged myself into the cab when Nune pulled up. We were dropped off at a building that housed a television station. It turns out that we were scheduled to be on a morning TV show! My 1st thought was: Oh no, what if people from work see me, this is not what I’m supposed to be doing while in Armenia for my actual job. The morning’s topic was animal welfare in Armenia and worldwide, and I was there as the expert on the latter. 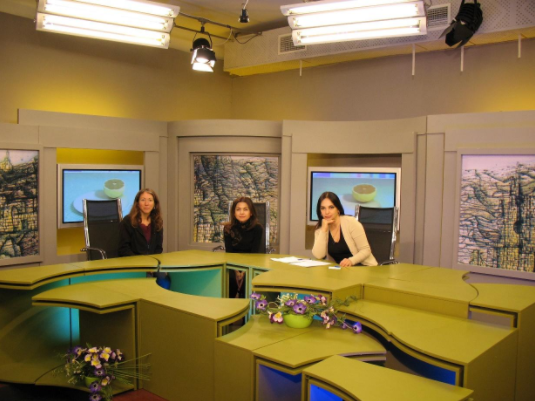 Although 98% of the show was in Armenian, the interviewer switched to English for a few minutes, while she interviewed me. If anyone I was working with saw the morning show, no one mentioned seeing me on it. The following day, I picked up my dog from the vet’s office, where she had remained for a few days to fully recover from surgery. Her time was up though and they needed her cage for other patients. So I brought her back to the guest house and planned to bring her to the shelter over the weekend, hoping she would stick around for a couple of days, as she had before her spay surgery. On Saturday morning, when I was preparing to go to the shelter with her, she was nowhere to be found. All day while at the shelter, I hoped that when I returned that afternoon, I’d find her waiting for me. She wasn’t. She didn’t show up on Sunday morning either before I left for my shelter visit. and many mouths to feed and that she would become one of the survivors. 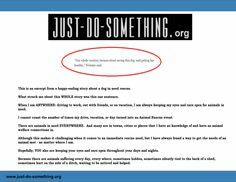 Nune and my friendship has thrived and the Save the Animals shelter continues to survive. The shelter has had its highs and lows. 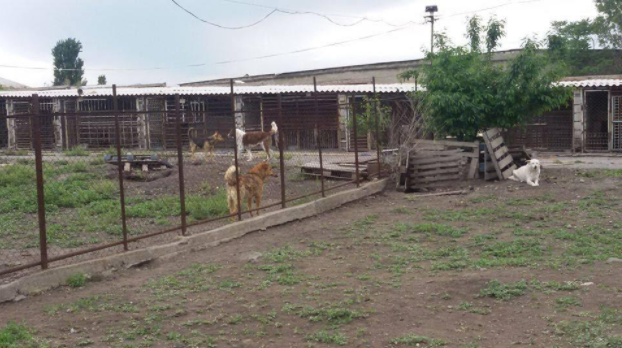 Armenia’s dismal economic situation means that fundraising for animal welfare is very difficult. 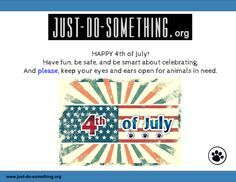 The organization that I started and direct, Animal-Kind International, made Save the Animals-Armenia, an AKI partner organization, and since 2009, we’ve been helping to raise money for the shelter. dogs inside the large shelter building. legs that were so misshapen, possibly from accidents long ago. 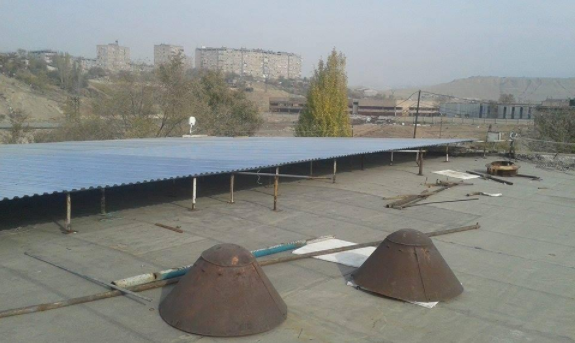 By the winter of 2012, an AKI donor had supported construction of a roof over the dog pens so the dogs are now warm and dry during cold, snowy Yerevan winters. 2 pictures above: AKI donated the money for fencing to section off the shelter yard so more dogs could get out of their pens for a longer period of time each day. 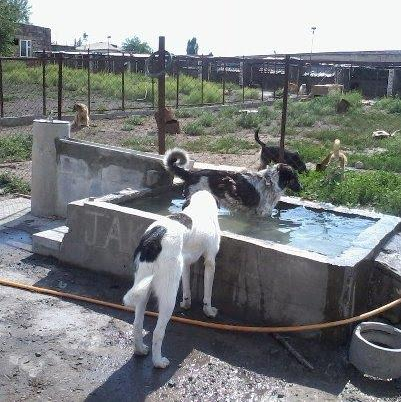 AKI funded the construction of a water trough, a great way to cool off in Yerevan’s hot summer months. where most people live in apartments, where no dogs are allowed, per capita dog ownership remains low. Now, the shelter houses about 180 dogs, so many of them elderly. Because funds are short, Nune rarely accepts new dogs to the shelter and she balances sheltering with keeping street dogs and cats fed and safe and getting them sterilized. The AKI-SAA partnership has endured for nine years and we hope to continue helping Nune Mehrabyan save Armenia’s animals. 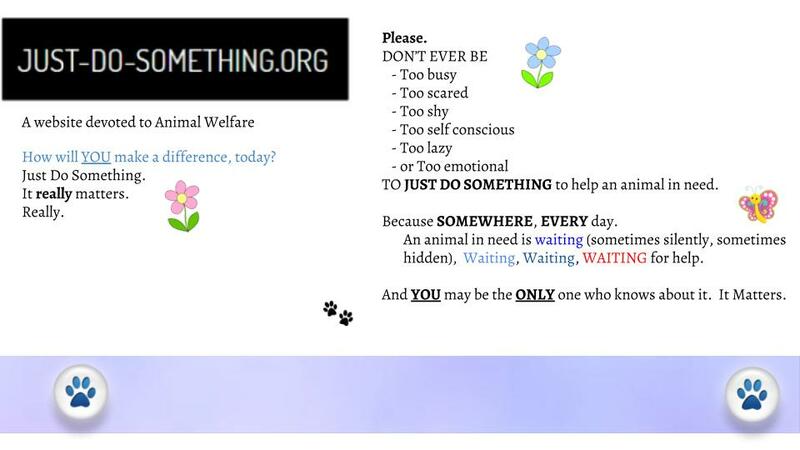 Karen Menczer is Founder and Director of Animal-Kind International, www.animal-kind.org, and for over 25 years has been working with animal rescue and protection organizations in resource-poor countries to raise funds for them and awareness about their work, their challenges, and their achievements. She is also an international environmental and biodiversity conservation specialist. Connect with AKI on Twitter, Facebook, and YouTube! So, tonight was going to be a different blog. But then we found Badly Hurt Cat. My husband and I were driving home from dinner this evening, and up ahead, on the cold dark road, cars were driving over a pretty large lump on the road. 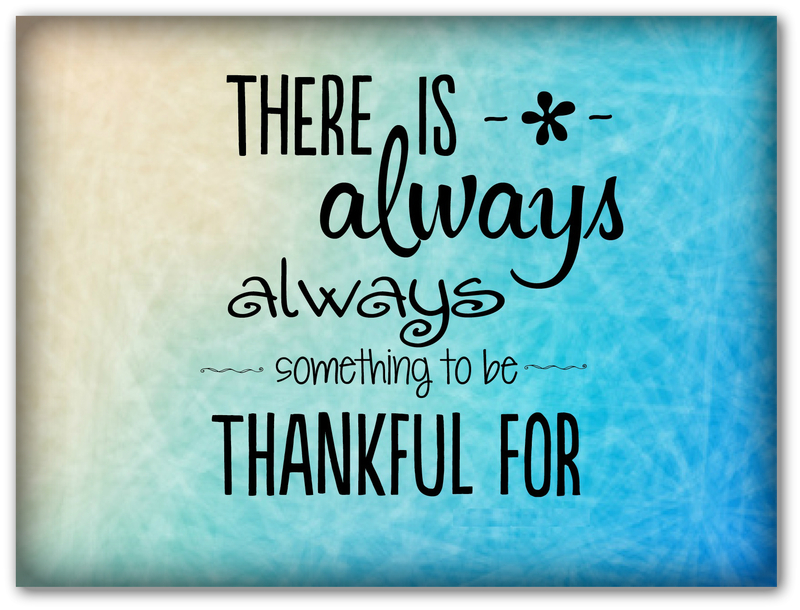 We always – ALWAYS – stop. We did a u-turn and drove up to the spot where something was lying in the road. It didn’t take more than a quick glance to see that this was an adult striped cat – green eyes open, not blinking, tongue hanging out of a mouth that wasn’t closing. I always stop, and I always wait. It took just another five seconds for Badly Hurt Cat to move. 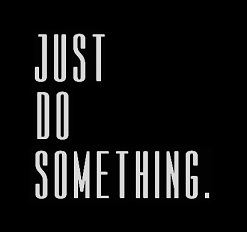 Making an effort to perhaps get up, or a reflex from still being alive but badly hurt from the trauma of being hit by a vehicle. Regardless, Badly Hurt Cat was alive – barely – and breathing, and not doing much else. Not even a sound. We immediately put on hazards, and positioned our car so that others would no longer drive over him, or her. We called 911 and let them know Badly Hurt Cat was severely injured but still alive. Sometimes 911 takes a while to answer a call, especially, we have found, when it comes to animals in need. Meanwhile, while my husband is in the car with the hazards, I am making rounds to the nearest houses on all sides of Badly Hurt Cat. S/he needed prompt medical attention, if in fact s/he would even make it to an emergency vet. Yes, Badly Hurt Cat was hurt that bad. At least in the county where we live, you can call 911 to come and shoot an injured deer (for example), but they will NOT shoot a domestic animal, even one as badly injured as Badly Hurt Cat. 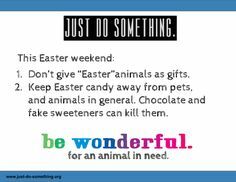 Which is a shame sometimes, because on occasion, it’s kinder to put a greatly suffering animal out of misery than to have to go through the motions of taking him or her to an emergency vet where they will just humanely euthanize that animal anyway. But the process makes that animal wait – something I disagree with when you know there is no coming back from such an injury. 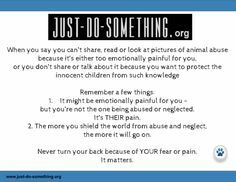 And, if you get caught euthanizing a domestic animal yourself – even when doing the humane thing, you will get arrested. Honestly, if I had had an axe, I would have put Badly Hurt Cat out of his/her misery immediately. S/he was that badly unjured, and obviously suffering a great deal. 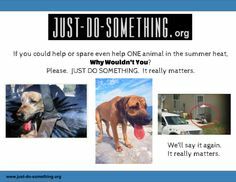 I would have glady taken a police car ride if it meant ending the suffering of an animal that needed that kind of help. I would not leave Badly Hurt Cat until I confirmed that 911 sent for additional help, and then they would be taking Badly Hurt Cat to the local Emergency Animal Hospital. When we drove away, the police car moved his vehicle to our spot, blocking Badly Hurt Cat from oncoming traffic until additional help came. That made me feel better, but not by much. Because I know that Badly Hurt Cat will not be healing from tonight’s accident. I am not sure the circumstances of how Badly Hurt Cat was hit tonight. But I am certain that the driver was aware that s/he hit something. It would have taken ten seconds to pull over and check. Badly Hurt Cat was a BIG cat. And s/he was left alive, lying in the road, so s/he would be difficult NOT to notice. But for whatever reason, the driver left the scene without obviously stopping to check – and that is unacceptable in my book. Dinner tonight ended sadly for me because of Badly Hurt Cat. 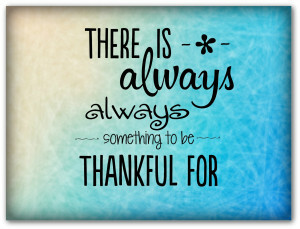 But how blessed I am that I have the deep desire to always stop, always check and always wait. Because tonight, I came to the aide of an animal in need, and because of that, at least Badly Hurt Cat will not still be lying on a cold dark road, hurt, and not be hit again (and again) until finally that little body has had enough. By the time I post this, Badly Hurt Cat will have been taken to the Emergency Animal Hospital and humanely euthanized. 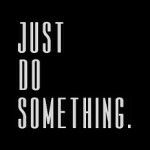 And tonight, that is the only reassuring thought out of a horrible thing. Please – it only takes a moment to make that u-turn, pull over, or keep your eyes open. It matters. It mattered to Badly Hurt Cat. The colder weather is upon us, and that means that the majority of those who smoke will be looking for warmer ways to light up. Previously, those who stepped outside, or opened vehicle windows to take a puff, will be doing that less and less.